Barco, Kathy and Borski-Howard, Melanie. 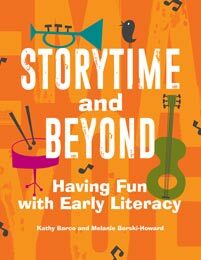 Storytime and Beyond: Having Fun with Early Literacy. Libraries Unlimited, 2018. ABC-CLIO, publisher.abc-clio.com/9781440858994. Join the world of balloons, pancakes, and musical instruments—just a few items that can help to improve early literacy in the library, in the classroom, and at home. Literacy builders covered range from music and instruments to magnetic letters, alphabet beads, and even food.